And I am back with 2nd session of our guest post series. If you missed out on the first session click here to read. The guest today on Flavors And Colors is Usha Bhat. I came across her name for the first time when I read her recipe for MW mysore pak. I was astonished to see the fantastic results she had got with those sweets. After few exchange of messages, where she clarifyied my doubts on the above recipe, slowly I got to know her in person. And as I became part of food group where Usha akka is an admin, it was no looking back to our friendship. A sweet person, a loving homemaker and an expert cook she is all enthu to try out different recipes and prepares some mouth watering foods. She [with her supportive hubby] manages FB food group efficiently and this has successfully resulted in a new venture, their own blog "Konkani Khann Anik Jevan" with an action plan to list and file most of the traditional amchi recipes in an easy accessible way. Congrats Usha akka and our best wishes once again for the huge success with the blog! 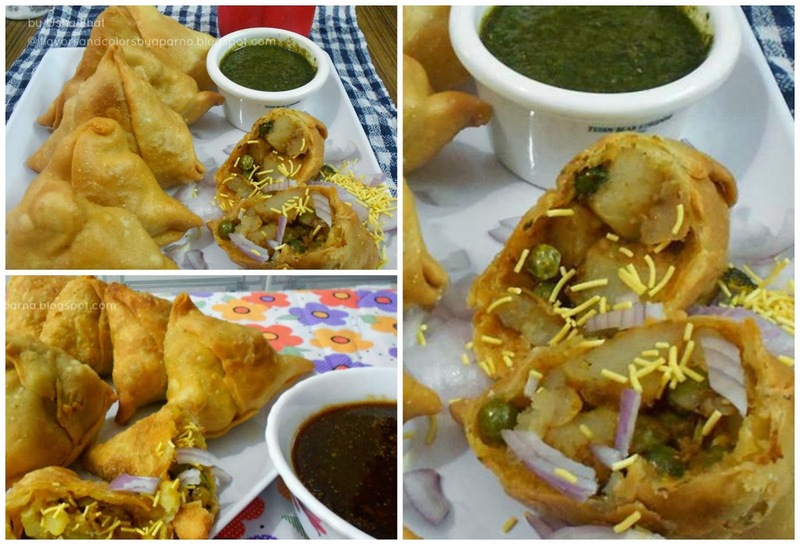 Today's guest post is on samosa, the most popular Indian appetizer and I am happy, Usha akka agreed to share her preparation and tips on making them. The below recipe will make 8 samosas of medium size. Take 1/2 cup of maida, add 1 tbsp of rawa, salt, oil and mix to form a crumbly mixture. Now add required amount of water gradually [plz chk above for the quantity mentioned] to make a soft dough. Knead it well to make the dough soft and pliable. Allow it to rest and keep it covered for about 15-20 minutes. Meanwhile prepare the filling as mentioned below in steps. Heat oil in a pan. Add cumin seeds and as they splutter add chopped green chilies and green peas. Saute them for few mins till green peas become tender. Lower the flame and add coriander powder, amchur powder and garam masala. You can add chilly powder [optional step] if you want the filling to be spicy. Now add boiled and chopped potatoes, coriander leaves. Mix everything nicely and cook it for 3-4 mins. Adjust the salt levels and switch off the flame. Keep it aside and allow it to cool. Divide the dough into 4 equal parts and make each into ball. Roll each ball with uniform thickness into 6 -8 inch round circle. Cut the rolled circle into half. Now take a semi circle piece, moisten the straight edge with water and pick it with both hands to fold into a cone shape. Seal the edges of this cone completely by pinching the dough. Stuff 2 tbsp of filling mixture into this cone and press the stuffing down with your fingers. Now close the top of this cone into a triangle shape, pinching the top edge so that it is completely sealed. 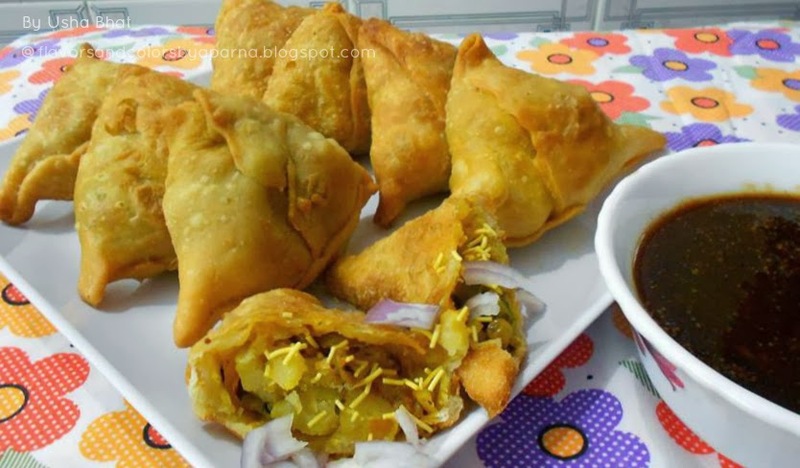 Use the rest of the dough and filling to prepare samosas in similar way. Take enough oil in frying pan [about 1 and 1/2 inch level deep]. Heat it while adjusting the flame to low medium. To test if the oil is ready or not, drop a piece of dough into the oil and it should sizzle and rise to top very slowly. Place the samosas in oil and slowly fry them. Once the samosas start floating on top, turn them slowly. Fry the samosas until they turn golden brown on all sides. Remove them from oil and place them on kitchen tissue paper. 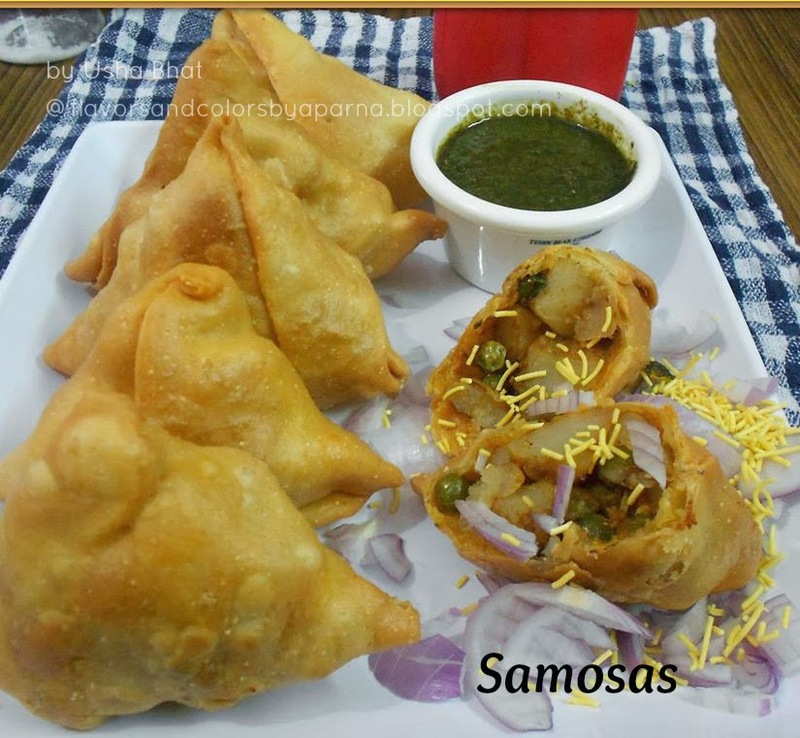 Serve hot and crispy samosas with chutney of your choice or sauce and a cup of tea ! Take care to deep fry on low to medium heat and not piping hot oil in order to get crispy, flaky covering for samosas. Also be assured that the samosas won't drink oil even if you fry them at low flame. So friends, aren't you all tempted to try this recipe at home and enjoy it with hot cup of tea/coffee. Go ahead and let me know your feedback. What is sooji and/or rawa?